Isaiah 43:2 (AMPC): "When you pass through the waters, I will be with you, and through the rivers, they will not overwhelm you. When you walk through the fire, you will not be burned or scorched, nor will the flame kindle upon you." If you are facing a situation that seems more difficult than you can handle, know that your Heavenly Father has promised to be with you and stand by you. If you ask Him for help, He will step forward to assist you and put in you the power you need to overcome. The process of going through deep waters and fire is often mentioned in scripture to indicate calamity. In most cases fire represents a time where our faith is proven. Psalm 66:10 says, "For You, O God, have proved us; You have tried us as silver is tried, refined, and purified." In the Greek, the word proved illustrates the process of testing metal to discover whether its quality is superb or inferior. James 1:3 says, "Be assured and understand that the trial and proving of your faith bring out endurance and steadfastness and patience." Later on in verse 12, James says we are to be patient under such trials. That word patient doesn't mean accept calamity, it means to remain steadfast, anchored and unwavering concerning God's faithfulness and His promises for you - while your circumstances are unfavourable. The only way to endure difficult times is allowing faith and patience to do their perfect work in us. This is how we inherit the promises of God in our lives. Refuse to give up trusting in the Lord and His willingness and ability to bring you through victoriously. 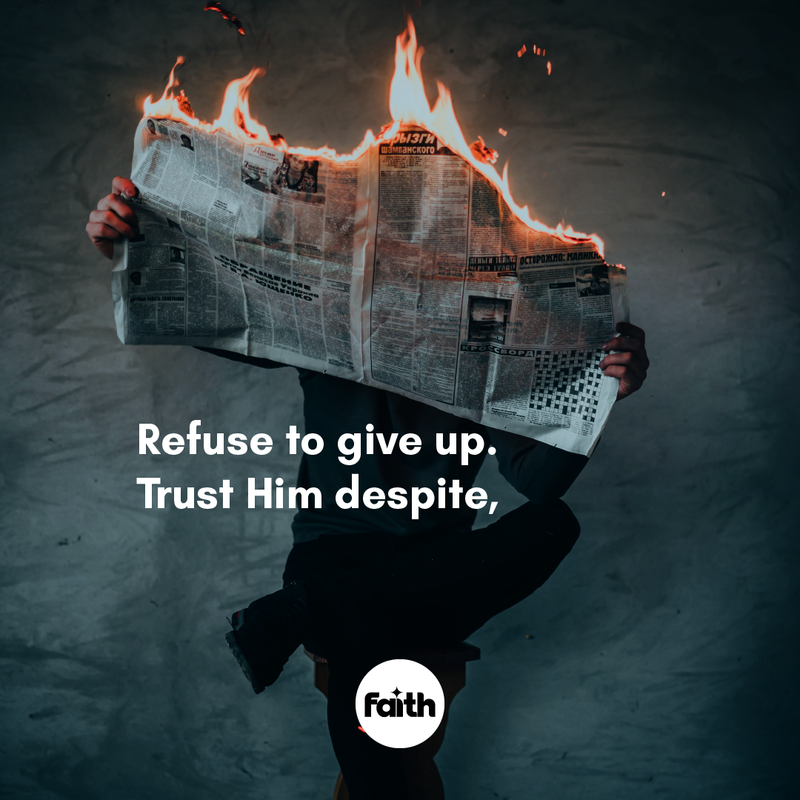 Decide to trust Him in the midst of the fire you are facing and rest in the truth that He is with and for you.